Summertime is a wonderful season, filled with sunshine, warm weather, and my personal favorite, casual and relaxed outdoor entertaining. I'm not one to show up to a party empty handed, and while I love to bring a homemade treat or bottle of wine, there are times when I like to do something a little more fun. Which brings me to gift baskets. I love putting together gift baskets for friends, family, and clients alike, as I feel there's no end to how creative you can be. It is a great way to celebrate the recipients' personalities, a special occasion, a holiday, or even a theme or destination (like this New Orleans inspired basket I did a few years ago). I recently put together a summer themed gift basket for friends and clients, who are now fortunate enough to call Hawaii their home. (Can you imagine??) I wanted to give them a gift that could be enjoyed in their new home, or more likely, outdoors on the lanai. 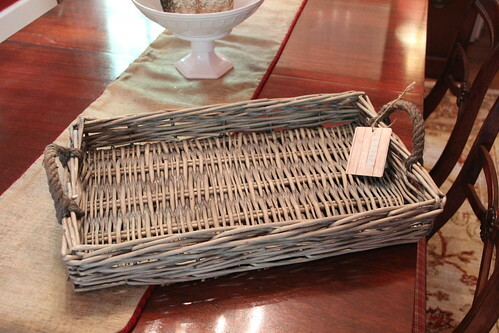 The same type of basket would also make a great birthday gift, hostess gift for a 4th of July celebration, or even just a fun surprise for a friend. So if you're looking for a good guide for a gift basket this weekend, this post is for you. 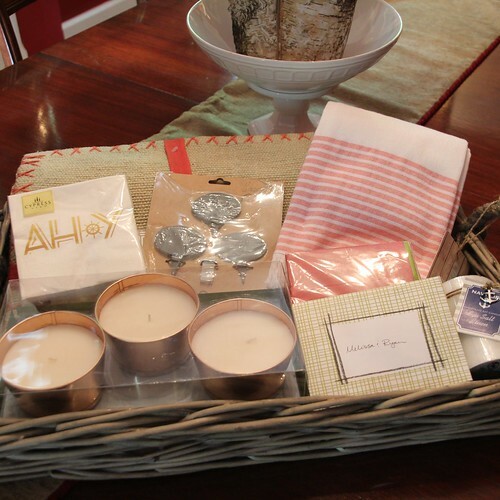 To start I hit up some of my favorite go-to stores, including HomeGoods, in search of the perfect items, including the "basket." I like to find containers that have multiple uses, and in this case, it's a casual woven serving tray that can function to easily transport drinks and food from the kitchen to an outdoor space. Metal or enamel drink tubs also work well for this type of summer theme. I then begin to layer in items that corresponded to outdoor entertaining. 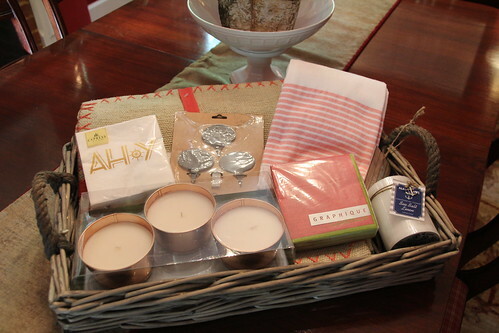 When putting together a gift basket, I try to establish not only a theme, but also a color scheme. 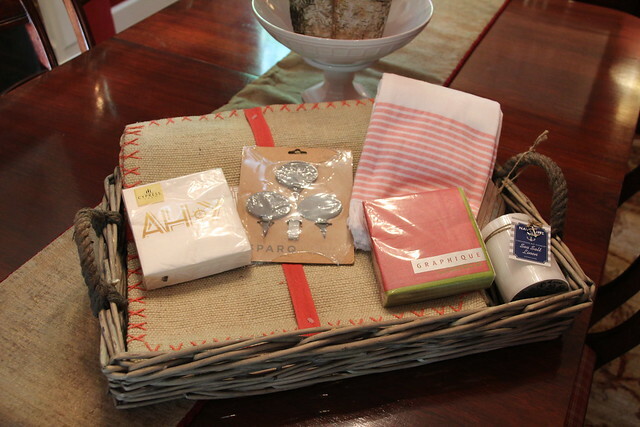 In this case, my summer/outdoor entraining basket will have a subtle nautical theme (a nod to their Hawaiian location) as well as a good mix of natural textures, neutrals, one strong accent color, and one metallic shade. 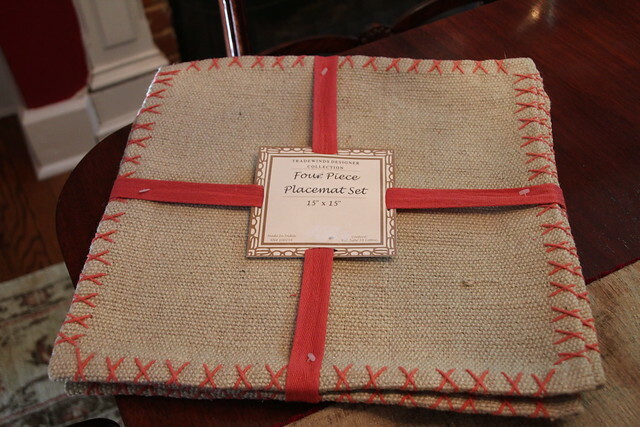 Using this casual set of burlap placemats as a jumping off point, I picked a light red/coral as the accent color. 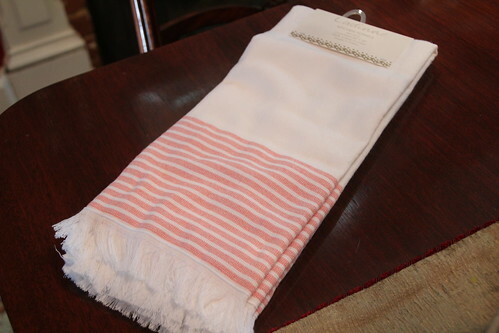 Playing off the red accent, I also included a set of dishtowels in a corresponding shade as well as a casual, rough cotton texture. Since it's not as significant of a texture as the placemat set, it's a good bridge between the rough placemats and the rest of the basket's contents. 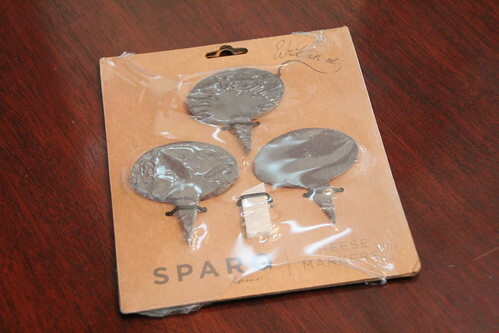 Keeping with the entertaining theme, I was thrilled to find this set of slate cheese markers. It also came with a little chalk pencil for proper labeling when in use. They say the best gifts are the ones you'd buy yourself, and I'm game for anything that helps get cheese from the fridge to my mouth in a well organized yet whimsical manner. Since there's nothing quite like an outdoor setting with nearby flickering flames, I also picked up this set of handmade citronella candles. 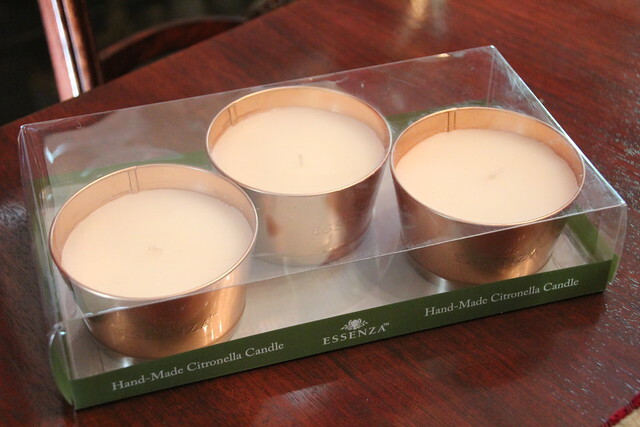 Keeping the bugs away definitely helps being outdoors, so these candles are both practical and pretty in their metallic cups. 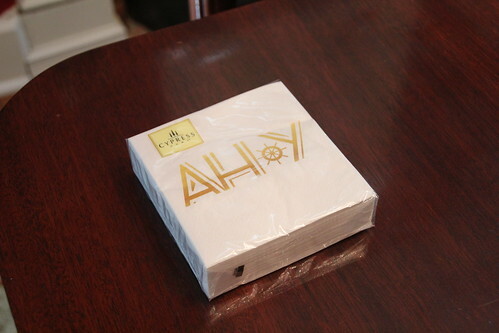 To repeat the gold of the citronella candles as well as the nautical theme I've now completely thrown myself into with my sea salt candle buy, I found these "Ahoy" paper cocktail napkins. Perfect! 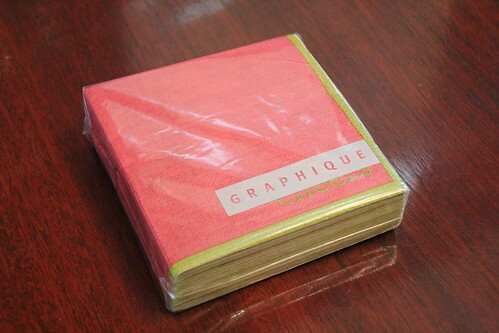 For good measure, and because you can never have too many cocktail napkins (because you can never have too many cocktails), I also included this red set. 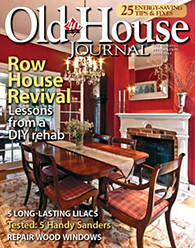 They served as another great way to pick up the accent color and gave me an additional layer of colors in the basket. With all of the items ready to go, my next step is to assembly my basket. I start by lining the bottom of the basket with padded filler, whether crumpled up tissue paper, shredded paper, raffia, or any type of materials that will help project the items as well as keep them in place. In this case I started with the soft placemats and didn't have to worry about adding anything else as filler. I spend time arranging everything so that it's stacked with the largest items in the back and smallest items in front. 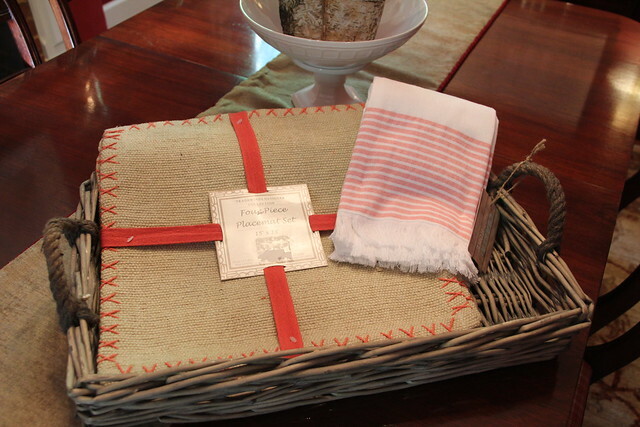 This way everything is visible when you present the basket to the recipient. It's also important to hide smaller items in nooks that seem like they were set aside just for that item. 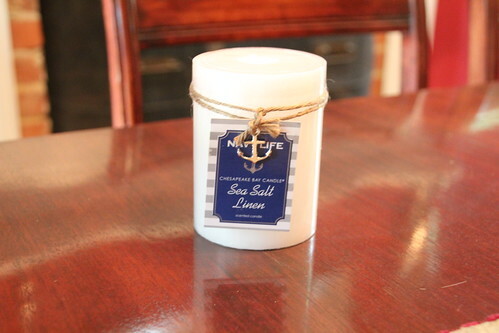 For example, I kept a little hole in the lower right so I could tuck the sea salt linen candle in that opening. Stacking in the final items really lets the basket take shape, but be sure there are no items that stick out in a particularly unwieldy fashion. The basket should be generally consistent so that wrapping it up is a little easier. I also always include a hand written note in the basket, as this adds an opportunity for that personal touch that's lacking from any mail order gift basket. After I have everything in place, one of the final steps is to wrap the basket with clear wrap. You can pick up this wrap from party stores, and I like to keep a role with my gift wrapping supplies. I find it comes in handy for gift baskets as well as smaller gifts like home baked goodies. In this case the size of the basket required me to cut two lengths of clear wrap. 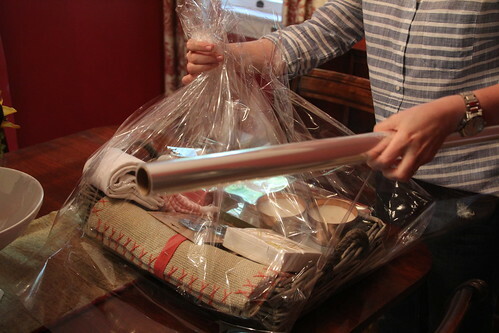 I then gathered the wrapping at the top to close up the entire contents inside of the clear wrap. The final step is to choose a pretty ribbon to tie it all together. 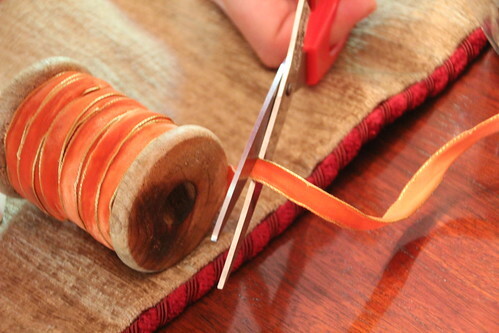 I didn't have the exact shade of red/coral, so I had to settle for this burnt orange velvet ribbon. I received a large supply of ribbon in a wrapping supply kit gift a few years ago, so I tend to always have something on hand. As I use up one of the ribbons I try to replace it with something comparable. In the case of this basket, a simple bow was the final touch. In this case since the basket had to travel by plane over several days, I didn't include any liquids or perishable items. But a bottle of wine and/or food items like chocolates, crackers, dips, or assorted nuts are are also nice additions to gift baskets. If you're putting together a fourth of July basket, you could include a box of sparklers, a small American flag, or other festive items that could add to the fun and celebration of the holiday. I love giving personalized gift baskets because it allows me to put thought and a little creativity into the gift I'm giving. It tends to be a bit more effort since you often need to shop at several different locations, and you need to think about the theme of the basket and the personalities of the recipients, but I like to think the gift giver should have as much fun giving the gift as the recipient has in receiving it, and this is how I like to accomplish this. Do you have any favorite ways of giving gifts you can share? I'd love to hear some new suggestions that I can use in my approach. Good reminder - I've been invited to a 4th of July party by one of my daughter-in-law's friends (the kids - son and DIL - and their kidlets will be there, too and they didn't want me to be alone on the holiday). I see a quick red/white/blue basket in my immediate future - like right after work LOL. Excellent! I hope you have a fun and happy 4th! Thanks, Franki! I hope you have a great 4th! Great way to personalize a gift. And you are right about the "treasure hunt" being fun for the gift giver. Do you have any photos of past gift baskets--even in the background of a photo? Some of us need ideas/suggestions/guidance. Thanks, SJ! Admittedly, I'm really bad about remembering to take photos of a lot of my gifts/projects. I recently gave my in-laws a gluten-free anniversary basket with champagne, seasoned assorted nuts, GF crackers, dried fruit, cured sausage, etc. I completely forgot to snap even one picture. There's a link in the post to a New Orleans basket I made as a thank you to friends who watched Lulu while we were traveling, but I've looked and don't think I have any other examples. I'll try to be better about this going forward!